You may not associate electronics with a company called Coincident Speaker Technology. The speakers they make are high efficiency designs (92.5 to 95 dB sensitivity) and proprietor Israel Blume began by designing tubed amplifiers and preamps electronics specifically to complement those transducers. Today there's a range of five speakers from the Triumph Extreme II ($2999 without stands) up to the Pure Reference Extreme ($26,800). Coincident cover preamp needs with their Statement Phono Preamp ($5999), Statement Line Preamp ($5499) and Statement MPC Step-up Transformer ($2499). The Dragon power amplifier on test today is their high power offering and is offered alongside the M300B Frankenstein Mk II singled ended triode design ($5999 per pair) which put out a maximum power of 8 watts per channel. Israel will also be happy to sell you cables to hook this all up, and I used a pair of his CST Power Cords ($609 each for the 10' lengths I needed). Steven R. Rochlin's choice of title for this magazine is right on the money. Enjoy The Music is exactly the right phrase for this hobby. When writing music reviews, I know I have a winner when I find myself enjoying the music. The same applies to my reviews of equipment. What matters is whether a particular component allows me to enjoy the music on my favorite recordings. There is a physical reaction – a heightened sense of awareness and involvement that separates the best records, the best equipment, the best listening rooms, from all others. If I start air-conducting, if I can't stop listening in mid-track but must play the whole piece, if I close my eyes, these are the physical signs that mark the exceptional. So thanks Steve for naming your web magazine with such insight. 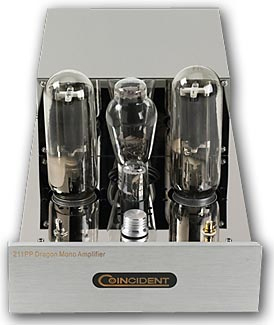 Also let me assure the readers that the Coincident Audio 211PP Dragon Mk II monoblock amplifiers clearly belong in that elite group of components that allow me to enjoy the music in full measure. With the solid-state ModWright KWA150 SE taking on the best qualities of tube amplification, and the tubed 211PP Dragon Mk II extending traditional tube strengths into a wider frequency band and lowering distortion levels across the board, we are seeing a convergence of sound ever closer to the ideal of a straight wire with gain. This is a trend I hope to see continued throughout the industry. Let's say goodbye to pro-tube or anti-tube bigotry and let the equipment stand or fall purely on its merits just as the ever improving performance of digital and analog sources may also lead to the discarding of similar and long lasting prejudices. For an uncompromising amplifier as ambitious as the Dragon, now in its Mk II status, with a high level of finish, long tube life, unfussy behavior, powerful performance, lack of traditional tube euphonics (read distortion), the asking price of $10,999 a pair is not out of line. The onus is now on more expensive power amps to be measured against these benchmarks and justify their extra cost. I was sad to see the Dragons go. Many thanks to Mr. Gold and Enjoy the Music.com for a highly insightful and informative review. The Dragon amps were created with the goal of providing as close an approximation of the sonic glory of our Frankenstein amps but without speaker driving limitations. The Dragons are fully capable of mating with virtually all sensibly designed loudspeakers. What makes them unique is their combination of high power and purity and transparency. While Phil readily heard those characteristics on his YG speakers and they mated quite synergistically, a more full range transducer with greater bass and dynamic capability would have been even more revelatory of the Dragon's special sonic qualities. The bass weight and articulation coupled with the transient attack of a high power DHT amplifier like the Dragon, is something to experience. The greater the speakers' frequency range, the more evident this becomes. My highest compliment to Phil for a thoughtful and articulate evaluation conducted in a very professional manner. Price: $10,999 per pair (including freight).